I don’t think my bringing up had so very much to do with making my son William the President of the United States. I had six children, and I had all of my own work to do. I did the best I could, of course, but I could not devote all of my time to him. William was naturally a good boy. He was not particularly a good baby. He cried a great deal. He was very, bright, and he began to take notice of things very young. He was a healthy boy. We lived in a country village, and he had plenty of outdoor air and exercise. He was a good boy in school, and his teachers always said he was very bright. He had his little squabbles with his brothers and sisters, I suppose, like all other children. I never paid much attention to that. He was always an obedient boy. He was very affectionate and he was very fond of his home. We were Methodists, though we never went to the extent of curbing the innocent sports of the children. William was taken to Sunday school about the same time that he began his studies in the village schoolhouse. He continued to be a faithful attendant every Sunday till he went away to the war. I brought up all my children to understand that they must study and improve their minds. My ideas of an education were wholly practical, not theoretical. I put the children into school just as early as they could go alone to the teacher, and the kept them at it. I didn’t allow them to stay away. As you may imagine, I had little time for their studies, though I kept track of their work in a general way through the reports and their teachers. I did most of the household work, except the washing and ironing, and made nearly all the children’s clothes,; but I saw that the children were up in the morning, had breakfast, and were promptly ready for school. That was the way five days of every week began for me. Ours was a hard, earnest life. My husband was always an early riser, and off to his work. I am now speaking of our life in Niles. At Poland he was away from home most of the time, and the whole burden of the family fell on me. We moved to Poland when William was about eleven years old. We went there because the schools were better. My husband was a foundryman. And his work kept him at Niles. William was a great hand for marbles, and he was very fond of his bow and arrow. He got so that he was a very good shot with the arrow and could hit almost anything that he aimed at. The thing he loved best of all was a kite. It seems to me I never went into the kitchen without seeing a paste-pot or a ball of string, waiting to be made into a kite. He never cared much for pets. I don’t believe he ever had one. We did not own a horse, so he never rode or drove. He was always teasing to go barefooted the minute he came home from school. In going barefooted, when he stubbed a toe or bruised his foot he was as proud of it as a king in showing the injury to other boys. When summer came he always had a stone bruise, and his shoes came off when the snow was off the ground. Although William had no taste for fishing, and rarely, if ever, attempted the sport, he was very fond of swimming in the deep pool on Yellow Creek, a little way above the dam. The swimming hole was reached by the left bank of the river, after crossing the bridge, and was shaded by a large black oak that spread its branches far over the water. Here the boys used to go after school on warm summer evenings and splash about in the water for some time. Our first home in Poland was on the main street, just east of the corner store. It was—and still is—a frame building, painted slate color, and was not as large as the houses we afterward dwelt in. I judge that it has not changed. Our second residences was further down the street, toward the mill, where Dr. Elliott now lives. The third house, now occupied by Mrs. Smithers, was on the opposite side from the other two and had a veranda along the entire front of the house. William was promptly entered at the seminary, and developed strong inclinations to study. In time he became a member of the literary association in the Poland Union Seminary, as the institution was called, and I frequently heard of his taking part in debates and other literary contests. Mrs. Morse, who was his teacher, says that he excelled in the study of languages, although he was fairly good at figures. I know that he was a constant reader, and by the time he was fifteen, he began to read poetry, being especially fond of Longfellow and Whittier, and I believe, Byron. From the time of his boyhood he gave up most of his sports, except ball playing, swimming, and skating. The boys played ball on the common behind the burying ground and also behind the seminary. Politically, the McKinleys were staunch abolitionists, and William early imbibed very radical views regarding the enslavement of the colored race. As a mere boy, he used to go to a tannery kept by Joseph Smith and engage in warm controversies on the slavery question. Mr. Smith was a Democrat, and so were several of the workmen about the tannery. These disputes never seemed to have occasioned any ill feeling toward William, because he was always popular with the very men with whom he had the most controversy. This was shown, also, by his being selected as a clerk at the little post office. As William grew older he developed fondness for the society of young women. This was encouraged by me. He had always shown great affection for his sisters, often preferring to remain indoors with them on holidays rather than to join in sports with other boys on the common. His boyhood days ended when he left home to go to the war. That took him out into the world in the broadest sense. Except a few weeks at Allegheny College, this was his first absence from home. What do I regard as essential in bringing up a boy to be President? I can scarcely say; there are so many things to teach boys. They should be taught to be honest in dealing with their fellow-men. They should win their respect and confidence. Then, boys should be brought up to love home, if you want to make good men, and Presidents, too, of them. The home training, such as is inculcated in the true American home, is a great safeguard to the lads of this country. Boys, to be good men, must be good to their parents. Any boy who wants to be President should be honest and truthful, and he should love his home, his family, and his country. No boy will ever be President who is afraid of hard work. I think religion is a great thing for a boy. I knew William was a bright boy and a good boy, but I never dreamed that he would be President of the United States. After all, I don’t believe I did raise the boy to be President. I tried to bring up the boy to be a good man, and that is the best that any mother can do. The first thing I knew, my son turned around and began to raise me to be the mother of a President. The above is from: Charles Henry Grosvenor, William McKinley, His Life and Work, 1901. Grosvenor prefaces this section with the comment below. 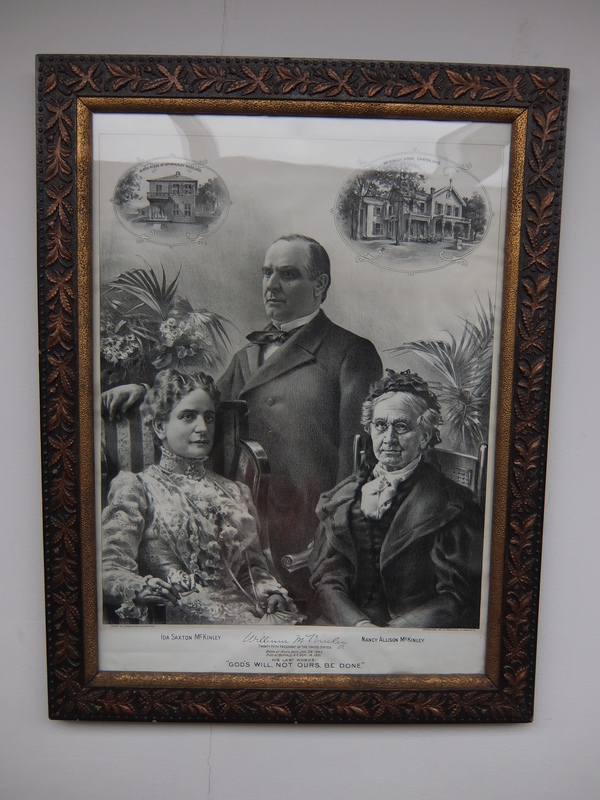 Copied by Dave Smith, December 2012 this image shows the President along with his wife Ida (mother of Katherine and infant Ida McKinley) along with his mother, Nancy Allison McKinley.